A major restoration project is under way in the Catholic section of a South Australian state heritage-listed cemetery to return a beautiful Gothic-inspired chapel to its former glory. Source: The Southern Cross. 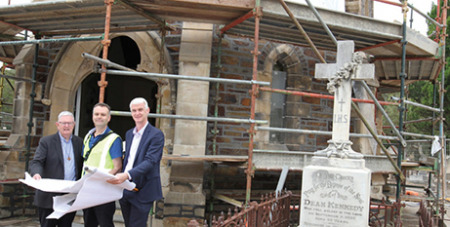 Work on the 148-year-old Smyth Memorial Chapel at West Terrace Cemetery began late last year and is expected to be completed by June, with a rededication service to be conducted later in the year. It is believed the $500,000 project is the first complete conservation work undertaken at the chapel since it was built in 1870. Restoration includes replacing the lead work and sheet metal roofing, general painting, window repairs, cleaning the bluestone walls, and lifting and relaying the slate and marble flooring inside the chapel. A key feature is reinvigorating the eight grotesques, often confused with gargoyles, which perch on the corners of the octagonal roof and make the chapel such a unique building. Other conservation work includes the carving of new crosses and bosses in limestone that has been imported from the United Kingdom to match the original stone, as well as blacksmith wrought iron mongering of new decorative hinges and door pulls. The restoration is being funded through contributions from the Archdiocese of Adelaide, the Adelaide Cemeteries Authority and the Department of Environment and Water. Designed by celebrated architect EJ Woods, it was built in memory of Fr John Smyth, a popular priest and Vicar General for many years. Fr Smyth, Archbishop Lawrence Sheil OFM and Archdeacon Patrick Russell are all interred in a crypt beneath the chapel.